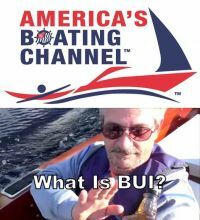 (live-PR.com) - Raleigh, NC, 12 April 2019 – The United States Power Squadrons® (USPS) continues the debut of its third season of safe-boating videos on America’s Boating Channel™ with “WHAT IS BUI?” which can be found online at americasboatingchannel.com and as a free mobile app available at Apple’s App Store and Google Play. drugs can seriously affect safe boat operations. Being a member of United States Power Squadrons — America’s Boating Club — is bigger than boating. It’s about friendship, memories that last a lifetime, bettering the community and being the most confident boater possible. USPS members become a part of the local boating community, enjoying time together on and off the water, even after the weekend ends and even when the temperature drops below zero. And as any member will explain, an educated boater is a better, safer boater. Every day, people are discovering that even a bad day on the water is way better than a good day anywhere else. So it’s important to work together to keep each other safe while having a fabulous time on the water. USPS vows to always keep learning, teaching, laughing, and helping fellow members get the most out of boating.